Throughout the year there has been an emphasis by supporters of the “Jesus Family Tomb” hypothesis as to how very rare the name “Yoseh” was during the Second Temple Period, based on the following assumptions. 1) The name “Yehosef” is seen as the predominant form of the name. If this is the case, then why do we find so many individuals named “Joseph” in Second Temple funerary inscriptions? It is clear that among the Jewish Hebrew ossuary inscriptions, the use of the formal name YHWSF “Yehosef” (17x) by far predominates over the informal, familiar form Y(W)SH “Yoseh” (2x). However, this is to be expected in funerary inscriptions. In any individual’s lifetime he would be called one of the two alternatives depending upon the formal or informal context in which the name was used. On an ossuary or a grave stone during the first century, like today, the formal name “Joseph” was almost certainly more appropriate than the deceased’s informal name “Joey” or “Joe” (which he might have been called while he was still alive). This does not mean that there are some people running about named “Joseph” and a separate group of individuals named “Joey”! Parallel to this are the formal and informal forms of the names Mariam/Maria, Yehoshua’/Yeshua’, Matitiyahu/Mattiah, Yehochanan/Choni, etc. (See “How do you Solve a Problem like Maria“). The near exclusive use of the informal “IOSES” (Greek for “Yoseh”) among the Greek inscribed ossuaries. 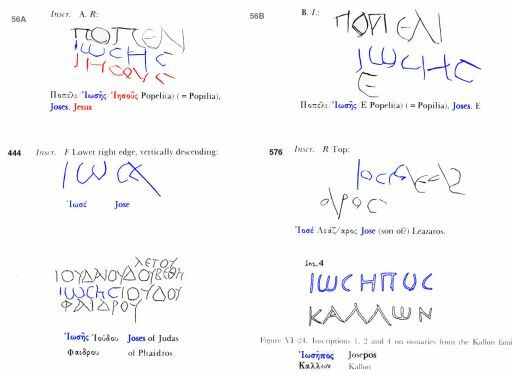 One should be careful to note that among the Greek inscribed ossuaries, the familiar form “Ioses” is used nearly exclusively (5 occurrences over 4 ossuaries). The formal name IWSEPOS is found only once. This is a fact that was not brought to the attention of the audience by the filmmakers. This is astounding, since the filmmakers also did not point out that the New Testament occurrences of this name IWSHS “Joses”, limited to the Gospel of Mark, are also in Greek. This name is used once in a list of Jesus’ brothers. <>It is found twice referring to the brother of “James the less”, the son of Clopus and Mary. Then why are these same individuals called by the formal name IWSHF “Joseph” in Matthew’s Gospel? 1) In Tal Ilan’s treatment under YWSF, the sole form of “Yose” in the ossuaries is spelled Y(W)SH, on two Jerusalem ossuaries (cf. T. Ilan, Lexicon, p. 152 no. 89 [Ilan rightly corrects this reading]; p.154 no. 118, 133). 3) In most of the Tannaitic manuscripts, YWSY is simply a minority alternative spelling of YWSH, both pronounced the same. YWSH (pointed “Yoseh” in vocalized versions) is by far the predominant form of the word in the superior Kaufmann manuscript of the Mishna.